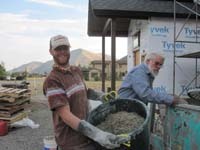 Builder Blake Eagle, left, and his father, Leonard Eagle, work on a house in Northridge in Hailey that will incorporate hemp in the walls. Local builder Blake Eagle and his wife, Angie, began researching healthy and sustainable building materials about four years ago for use in a house they planned to build in the Northridge subdivision of Hailey. They settled on a material with high thermal mass that does not require the usual amount of chemicals and vapor barriers used in conventional construction. “It just makes sense to build our living environment using natural, breathable materials in a healthy, sustainable manner as our budget allows,” Blake Eagle said. It took the couple nine months to receive permitting from the city of Hailey to proceed with construction of their two-story, wood-framed Northridge home. The delay was due to their decision to use a thick layer of hemp and a non-concrete lime binder in the walls of the building. The material is poured like concrete into forms surrounding the framing and replaces insulation in the walls. Hemp is a low tetrahydrocannabinol (THC) variety of the plant Cannabis sativa. THC is the compound that gives cannabis its intoxicating effect. Estimates indicate that of the approximately 2,000 cannabis plant varieties known, about 90 percent contain only low-grade THC and are most useful for their fiber, seeds and medicinal or psychoactive oils. “People keep asking me if they can smoke my house,” Eagle said with a laugh. The answer, in a word, is “no.” Hemp—which doesn’t produce the same intoxicating effect as its cousin marijuana—is mainly used for industrial purposes. It can be used to make paper, textiles, clothing, biodegradable plastics and in construction. The Eagle family used Hemcrete, a commercial product bought in Canada and shipped to Idaho. Blake Eagle said the material costs more than conventional siding materials, but will last much longer. Eagle said the 12-inch-thick Hemcrete walls will wick moisture away from the interior of the building while providing thermal mass that keeps the home cool in summer and warm in winter. As far as Eagle knows, it is the first hemp building in Idaho. The two-story, wood-framed home is built to Energy Star certification standards, and in keeping with Hailey's better-building practices, is aimed at reducing carbon footprints and reducing greenhouse-gas emissions. Because hemp growing uses very few pesticides and herbicides, and the lime-based binders use less firing time than concrete, the materials in the Eagles’ home are considered to have less impact on the environment. Yet because the building materials have not been cleared by the International Code Council, the agency that authorizes the International Building Code adhered to by municipal building departments, the Eagles had to supply a 200-page report to the city of Hailey before proceeding with their project. The home was approved based on the report. “We will experience and collect actual living performance data on this style of building first-hand in order to show comparison with current building practices,” Eagle said. Such information could prove useful to the International Code Council, which opened a 30-day public comment period on Oct. 1 to help study the viability and safety of hemp for use in construction.